Anhydrite screeds have become quite common as they offer benefits over sand/cement screeds. They are relatively easy to lay, low cost, fast-drying, pumpable, self-levelling and offer minimal shrinkage. They are suitable for use with under-floor heating as long as pipes/elements are covered by 25mm. However, tilers must be aware of a number of potential problems. 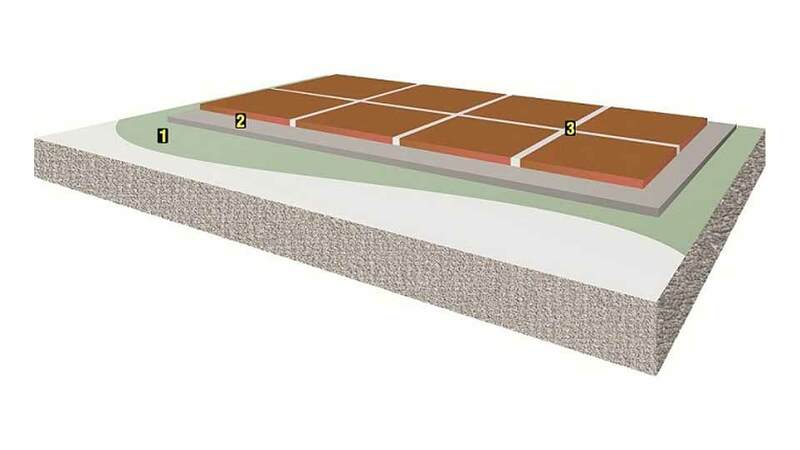 When a cement-based adhesive is applied directly onto the floor, cement in the tile adhesive reacts with the gypsum in the screed resulting in a mineral called ettringite being formed at the interface. The associated structural change is sufficient to cause a complete debond of the cementitious adhesive away from the screed base. As anhydrite cures, a weak layer of laitance is formed on the surface. This layer is too weak to tile onto and also slows the drying time of the screed. Anhydrite screeds are made from inert fillers such as sand, with a binder system based on calcium sulphate. Consequently they can look very similar to a sand/cement screed. Anhydrite will tend to appear lighter, sometimes almost white, but in practice it is difficult to identify an existing anhydrite screed from a traditional one. If a screed is known to be anhydrite it must be thoroughly sealed before the application of a cement-based tile adhesive. If the screed type is not known and it is believed that it could be anhydrite, the screed should be thoroughly sealed as a precaution. The cured anhydrite screed will have a layer of laitance that will need to be removed after 2-6 days (dependent on brand of screed used). This will provide a dense surface to tile onto and will aid drying. Ensure the floor is fully dry - the residual moisture level should be less than 0.5%. Drying times vary according to the brand of screed used. Some are designed for fast-track use, whilst others require the standard drying times. If no other information is available assume the screed will take 1 day per mm up to 40mm in thickness to dry in normal conditions. Screeds thicker than 40mm will require 2 days per mm. Seal the floor with weber PR360 repeatedly until no more is absorbed and allow the primer to dry before tiling. An uncoupling membrane can be used to reduce stress on the tiling layer and to ensure that ettringite does not cause a failure. Fix tiles into a solid bed of weberset pro lite - rapid or weberset rapid SPF at least 3mm deep. Leave joints at least 3mm wide for grouting and make provisions for movement. Fill the joints between tiles with weberjoint pro or weberjoint wide, and use weberjoint silicone sealant to fill perimeter movement joints.